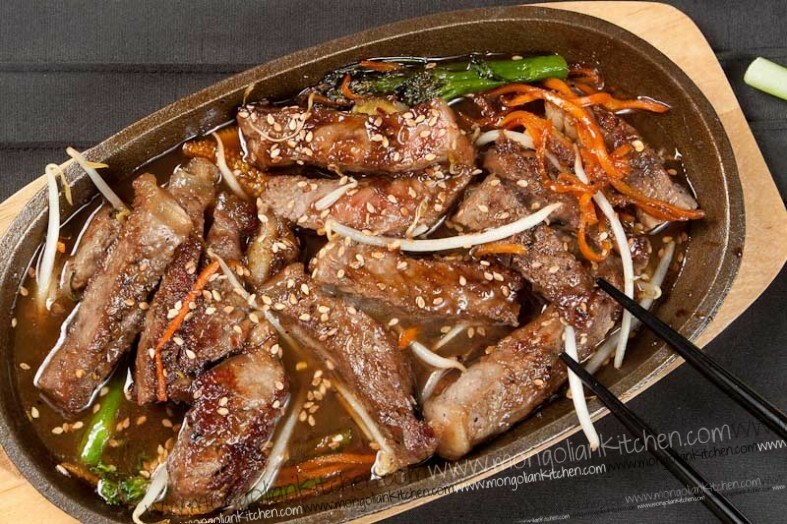 Yakiniku Beef is a dish we first tried in the Maldives in 2011. It was Wagyu beef with a Yakiniku Sauce served in a teppanyaki restaurant. Chef Alfie first grilled a wonderful piece of beef (simple seasoned with salt and pepper) then added it to a sizzling platter and topped with this amazing dark sweet and savoury sauce. We loved the dish and its simplicity so we asked the Chef for the recipe. The recipe is actually very similar to our Mongolian Beef recipe. In fact since we tried it with the hondashi seasoning we started making our Mongolian beef with that too. The hardest part of the ingredients was this hondashi seasoning which is a bonito fish based seasoning mix. So the process is quite simple once you make the Yakiniku sauce. You simply grill the beef, slice it then top with the Yakiniku sauce. We used a sizzling platter which we heated up, then sautéed some vegetables before adding the beef and topping with the sauce. This is the original dish served by chef Alfie, which we modified a little (we didnt have any black sesame seeds). To make the Yakiniku Sauce, first fry the ginger and garlic in 1 tsp sesame oil for 1 minute. Add the rest of the ingredients and simmer for a further 2-4 minutes until the sauce is of a thick consistency. Check the flavour and add any more sugar/honey/salt as needed. Season your beef with salt and pepper and fry on a skillet or griddle pan over a very high heat for around 4-6 minutes (this depends on how you like your steak, but cook it for less time as it will continue to cook on the sizzle plate. Once the steak is done remove from the heat and allow to sit for 2 minutes, then slice into thick strips. If you are using a sizzling platter heat it in the oven then place on top of the hob. Add a knob of butter then your vegetables and allow them to cook for 2 minutes. Add the beef then pour over the yakiniku sauce and allow to cook and reduce for a further 2 minutes. If you are not using a sizzling platter then simple cook the vegetables in a wok or frying pan and add the beef to that. The sauce looks amazing. Being a vegetarian I will try it with tofu. There is a restaurant in Chinatown ( Philadelphia) that makes a Mongolian Vegetarian Mock Pork dish that I love.This sauce reminds me of it. Amazing tutorial.